As everyone and their dog is aware, the 100 Masters exhibit was on display at the Winnipeg Art Gallery (WAG) all summer and came to a close this past weekend. Don’t get me wrong, it was really exciting that Winnipeg would get such a collection installed in our city. But, when I got my chance to go view the work, the atmosphere put me off. Really? I paid $22.00 to view paintings in a public art gallery but only from a certain distance? Do people really take in art this way? Art is a language that should be accessible to everyone – luckily the WAG isn’t the only place you can find it. “Winnipeg is filled with gaps, empty spaces, cracked surfaces, and crumbling buildings. At one level this urban reality speaks to the economic realities of the city and the incremental abandonment and decay of its infrastructure. Yet these bits of the urban landscape are also sites of possibility for creation [and] critical engagement,” says David Churchill, co-founder of a new DIY installment space called the Hole in the Wall Gallery. It’s exactly as it sounds: off of the corner of Portage Avenue and Arlington Street there is an alleyway with a brick wall containing a not-so-glorious hole. 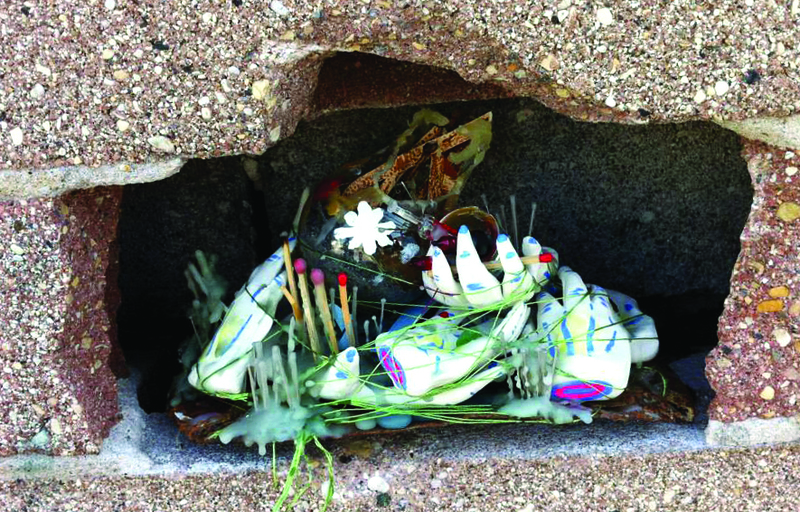 Since their first installation on Aug. 11, every Sunday afternoon a new artist puts a piece of artwork in the hole and leaves it there unattended, its fate left to be determined by the elements and passersby. The hole was discovered by Churchill and his partner Frank Livingston—both artists and enthusiasts—while walking through their neighbourhood. The hole is welcome for artists of any level or background to participate in – the first installment took place on Sunday, Aug. 11 and was done by Cliff Eyland, an associate professor in painting at the University of Manitoba. Eyland is no stranger to showing in DIY or secret spaces; while he is the artist responsible for the installment of over 1,000 index card sized paintings at the Millenium Library, he has been known to leave work tucked inside of library books to be found by unaware strangers. On Sunday, Aug. 25, artist Dany Reede installed a small sculpture he designed specifically for the hole. Reede, who exhibits in solo and group shows regularly and is the creator of the Manitoban-featured Baby Hands comic strip, finds most of his inspiration from garbage he finds on the ground. His sculpture involved several tiny claw-like hands made out of Sculpey, a broken light bulb, sewing pins, and wooden matchsticks all bound together with candle wax. If you are interested in following the Hole in the Wall Gallery or even submitting work of your own, you can find their group on Facebook. They meet in the alleyway every Sunday afternoon to install a new piece of artwork. And next time you go out for a walk, keep an eye out; you never know when you’ll stumble across some secret art.